I love Pittsburgh. Sure, it's still a bit worn around the edges from the steel mill days, but that's what gives it its unique character. My favorite place to this day is the "Strip District" near downtown, which is a market district along Liberty Street. I used to go to folk dance weekends in Pittsburgh back in the 90s, and I had some great friends and some great times there. I even thought of moving there once. Apparently I did not. "It is important to note that the celebration of the Roman Missal of Pope Blessed John XXIII is not permitted at regularly scheduled weekday or Sunday." By itself, this would appear to be at odds with the terms of the motu proprio, and therefore with the stated wishes of the Holy Father himself. Such a posture seemed wanting for an explanation. So this morning, I wrote the co-author of the statement, the Very Reverend Lawrence A DiNardo, Vicar for Canonical Services of the Diocese of Pittsburgh, and asked for one. I am aware of the establishment of St Boniface/Holy Wisdom Parish, and that it has served the needs of those attached to the ancient usage of the Roman Rite until this time. My concern is limited to a statement which appears more restrictive than what is called for in Article 5 (especially 5 § 2), inasmuch as it would disallow subsequent requests of any other group of the faithful, say, in another part of town. It is my understanding that statements with force of law in a motu proprio are to be interpreted broadly, rather than narrowly. I am also aware that the English text of the decree is not definitive, and that proper interpretation is dependent upon the Latin text. I would appreciate any clarification you could provide in this matter. I thank you for your time, and look forward to hearing from you. Just this afternoon, the good Father was kind enough to respond. I just know you'll all read this with an open mind. You offer two distinct questions. This memorandum is only the first glance at understanding the Motu Proprio and is not intended to be the final practice in the diocese. Second, one must read the second bullet as one bullet. The sentence involves the Masses celebrated without people. Masses without people are not regularly scheduled otherwise they would be Masses with people. It is not intended to imply that public Masses cannot be celebrated on weekdays or Sundays. This was informational to priests. Secondly, the Mass at Saint Boniface is the only stable community at present. It may be that other stable groups will be established. It does not exclude the possible that there will be others in the future and when they are present the Mass will be celebrated. I think we do not want to take statements out of context or read into them something that is not stated or intended. 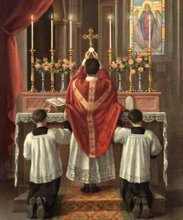 The Diocese has had a long history of implementing the Latin Mass and granting provisions beyond what has been provided for in the norms. I think that the same will be said of the Motu Proprio. It should be noted that Father DiNardo, in addition to his role at the Chancery, is also pastor of Holy Wisdom/Saint Boniface Parish, where the classical use of the Roman Rite has been offered every Sunday for a number of years now. (Several years ago, a group of pilgrims from that parish came to Washington to visit the National Shrine, in the hopes of being able to celebrate the "Old Mass" there. When they were refused, the Franciscan Monastery offered them sanctuary. I had the good fortune to assist them, by arranging for servers for their Mass from Old St Mary's, as well as an excellent schola.) It should also be noted that Pittsburgh is currently without a reigning bishop, having lost the Most Reverend Donald Wuerl to his current position as Archbishop of Washington just over a year ago. (Auxiliary Bishop Paul Bradley is currently serving as Diocesan Administrator.) As with any other large organization, it is difficult to implement a new policy on much of anything without someone firmly in the big chair. Finally, one would hope this serves as a further reminder of the wisdom of Father Zuhlsdorf's "Rules of Engagement" on the matter in question. Taking everything into account, it is certain that Pittsburgh would be as favorable as any other diocese, to the prospect of further requests for the ancient usage. And so, this week's Tip of the Black Hat goes off to Father Lawrence A DiNardo of the Diocese of Pittsburgh, for being such a good sport. There's more fizzle than taste in the controversy here. When I read the Pgh statement, I read the WHOLE thing--and in the last paragraph, it is clear that the statement is operative until 9/14/07. Some other commenters seem to think that Pgh is flim-flamming the public here. I don't. "Until the effective date of the Motu Proprio and until there is further direction from the diocese, there may not be any change in the present practice regarding the Roman Missal of Pope Blessed John XXIII." "You are under strict orders to make no changes with regard to the old mass until the motu proprio is effective, and then only after receiving direction from the diocese." This is a much stronger statement than simply, "The directives contained in this memo are operative until 09/14/07." If I am right, then even after the motu proprio takes effect Pittsburgh pastors' hands are tied until the diocese says otherwise. Also, I think there's still a misunderstanding or narrow interpretation of "stable group of faithful" implied in Fr. DiNardo's response. My reading of Article 5 is that if a "stable group of faithful who adhere to the earlier liturgical tradition", however one defines that, exists in a parish and that group requests Tridentine masses to be said at their parish, every reasonable effort should be made to make those masses available to them. If Holy Wisdom Parish at St. Boniface is considered the only stable group of faithful adherents to the old mass in the diocese of Pittsburgh, the bar has been set rather high. In fact, we're still caught in the catch 22. The line of reasoning seems to be that the diocese has generously made Tridentine masses available under the Ecclesia Dei indult and thereby created the only stable group of adherents. By that logic, the diocese would have to exercise its generosity again to establish another indult community in order to establish another "stable group of faithful who adhere to the earlier liturgical tradition". This is quite contrary to the letter and spirit of SP. As Benedict says, "The present Norms are…meant to free Bishops from constantly having to evaluate anew how they are to respond to various situations." That is, more decisions regarding offering the old mass should be made by pastors and fewer by bishops. Consequently, the faithful will be free to form stable groups in parishes and those groups will be free to request masses according to the extraordinary use of the Roman missal, independent of the generosity of diocesan officials. Should their pastors and the bishop be unwilling or unable to grant their requests, such groups would have recourse to the Pontifical Commission Ecclesia Dei, which will have juridical authority it may not have had previously. Personally, I think you're reading too much into this. In the first place, the decree does not take effect until the 14th of September. Believe me, that is barely enough time for pastors to go re-arranging their schedules on the chance that there will be a sudden rush of demand for the classical Roman usage. Whatever determination the pastor makes concerning "stable groups of the faithful," it is to be under the guidance of the local bishop, as stated in the decree. This is not to constrain anyone, but to ensure that once such a Mass is scheduled, with commitment of time and resources, it will be sufficiently well-attended, which frankly doesn't always happen. Hence the need for a stable group. Finally, since this is something that has no precedent in living memory (if any memory at all), I would suggest that we are going to have to make a leap of faith (albeit more difficult in some locales than others), and trust that people who have issued such memoranda are indeed taking the motu proprio seriously. Critical Mass: Life After "Te Deum"